No. 7 Virginia Tech bounced back from their mid-week loss to No. 1 UVA by defeating Wake Forest 87-71 in Cassell Coliseum on Saturday afternoon. The Hokies moved to 15-2 overall and 4-1 in the ACC with the win, while the Demon Deacons dropped to 8-9 and 1-4. This was somewhat of a bizarre game from the beginning. Official Mike Eades injured his knee just minutes into the game, and could not continue. The rest of the game was officiated by just two referees, Jerry Heater and Clarence Armstrong, and the result was a foul fest that saw both teams whistled for a total of 42 fouls and combine for 60 free throw attempts. Wake Forest went 27-of-38 (71.1%) from the free throw line, while the Hokies went 18-of-22 (81.8%). Despite being outscored from the charity stripe, Virginia Tech easily handled the Demon Deacons on both ends of the court. After going through a two-game offensive slump against two excellent defensive teams, the Hokies were 29-of-51 (56.9%) from the field on Saturday, and 11-of-26 (42.3%) from three-point range. 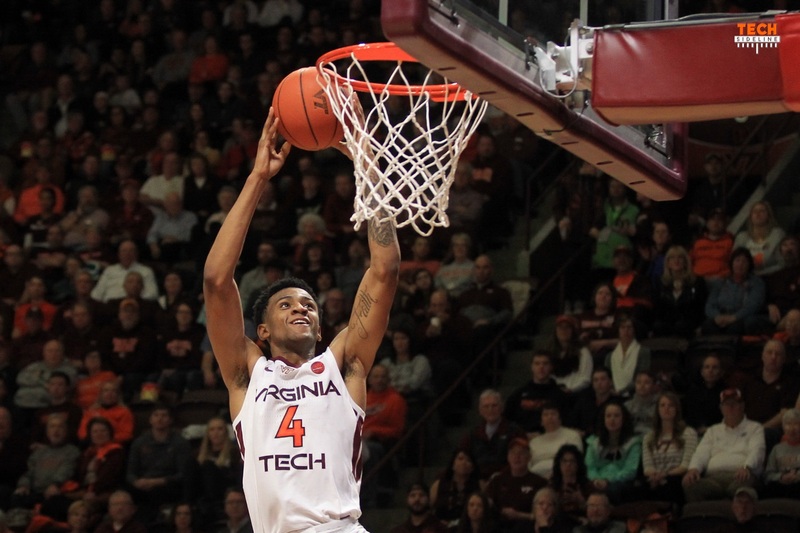 Sophomore guard Nickeil Alexander-Walker led the Hokies with 24 points. He was 7-of-12 from the field, 3-of-7 from the outside, and 7-of-9 from the free throw line. He also had seven rebounds, four assists and a steal to finish the day with a complete performance. Four other Hokies also scored in double figures: Ty Outlaw (14), Justin Robinson (13), Ahmed Hill (12) and Kerry Blackshear (11). It was a close game early, though Virginia Tech eventually took a 42-32 lead into halftime and increased that lead to 20 points in the second half. Wake Forest made a couple of runs with Nickeil Alexander-Walker and Justin Robinson on the bench in foul trouble, but they were never seriously able to mount a comeback. Though Tech was outrebounded 33-23, they forced 15 Wake Forest turnovers and committed 11 themselves. The big difference in the game however was Virginia Tech’s defense. The Demon Deacons were just 18-of-48 (37.5%) from the field and 8-of-24 (33.3%) from the outside. Wake Forest guard Brandon Childress had 28 points, but no other Demon Deacon scored more than eight. 5-star forward Jaylen Hoard had just seven points and attempted only three shots. “Defensively, Virginia Tech is a really talented team,” Manning said. “I know we’ve said this time and time again, but against teams like that, you’ve got to make a decision. It’s either a pull up or a pass if you can’t get all the way to the rim. Virginia Tech head coach Buzz Williams was pleased that his team responded well from Tuesday night’s loss at UVA, though he felt like only having two officials didn’t allow for the game to have much of a flow, so he took it upon himself to try and energize his team. The only negative from the game is that sophomore forward PJ Horne injured his knee. He went to the locker room and later returned to the bench with his knee heavily iced. The Tech medical staff will assess his condition on Sunday. The Hokies will return to action on Monday night for a big matchup with No. 13 North Carolina in the Dean Dome. Tipoff is scheduled for 7pm, and the game will be televised nationally by ESPN. The Hokies entered the game ranked 9th in the AP poll and 7th in the USA Today Coaches poll. Official Mike Eades left the game early in the first half due to injury. The remainder of the game was officiated by two referees. Nickeil Alexander-Walker scored 24 points. He has scored in double figures in 15 of the 16 games in which he has played this season. He now has eight games of 20-or-more points. He also grabbed seven rebounds, a new high for him in ACC action. Ty Outlaw scored 14 points, the fifth time this season he has scored in double figures. He was 4-of-5 from three-point range. Justin Robinson scored 13 points, the 13th time this season he has scored in double figures. Ahmed Hill scored 12 points. He has scored in double figures in 13 games this season. Kerry Blackshear Jr., scored 11 points, the 14th time this season he has scored in double figures. The Hokies’ 87 points are the most for Tech in an ACC game this season and the most in an ACC game since Tech defeated Boston College, 91-75 in Chestnut Hill on Feb. 25, 2017. The last time Tech scored more than 87 points in an ACC home game was on Dec. 31, 2016, when the Hokies defeated No. 5 Duke, 89-75, in Cassell Coliseum. The two teams combined to shoot 60 free throws, by far the most combined this season for a Virginia Tech game. The previous high was 50 combined free throws in the win over Boston College. The Hokies were 18-of-22 from the line, for 81.8 percent. That marks the seventh time this season the Hokies have shot at least 80 percent from the line in a game. Wake Forest’s 38 free throw attempts were the most by an opponent against Virginia Tech this season and the most by an opponent since Buzz Williams arrived in the 2014-15 season. The previous high was 35 on three occasions, most recently in the win over Washington in Madison Square Garden last season. Tech is now 35-31 all-time against Wake Forest and has won the last three meetings in the series. Tech is 23-11 in home games against the Demon Deacons and 15-8 in games played in Cassell Coliseum. Tech is 12-7 in ACC regular season games against Wake Forest. So far we’re beating the teams we’re supposed to beat (P$U excepted). Let’s take a giant step forward and beat the UNCheat Tar Heathens in the abomination otherwise known as the Dean Dome! A lot of fun watching this one in Cassell with a near packed arena. Would have scored over 100 if it wasn’t for the momentum killing refs. Really hope PJ is ok too, that will be a huge loss if he isn’t back soon. He’s been giving us great minutes, and Buzz even gave him the start last night. You would think that one less official would lead to LESS foul calls. Making phantom calls based on things they thought might have happened. Plus, sending a signal that even though there are only two of them, they’re in control of the game. Really impressed with the D especially a couple of times when Wake couldn’t get a shot before the time ran out. Fingers crossed on PJ Horne. VT is already down three players this year. We cannot afford any more injuries or attrition.